Spur of the moment a few weeks ago, I decided to invite myself and join a friend for a few days in Iceland. It had always been on my wish-list and after sending countless friends to this incredible insular country, it was time to see if for myself. It did not disappoint. Au contraire. It was so amazing, I seriously considered not getting on my plane to come back to Scotland. Even though I have been to many countries that I loved, I never considered not leaving when my time was up. Except for this time. I loved my Icelandic experience so much that for the first time in my life, I actually could picture myself moving somewhere in the country. And settling. Somewhat anyway. I would obviously need a job and all (by the way, any of you happens to know someone hiring in tourism in Iceland?) but to come back and actually consider this is a very weird feeling, to say the least! At first, I was worried to see if I would like Iceland as much as I thought I would. My expectations were so high, I was actually afraid of being disappointed. Instead, I fell in love with the place even more than I thought possible. This was to be a small incursion. A little taster of Iceland. 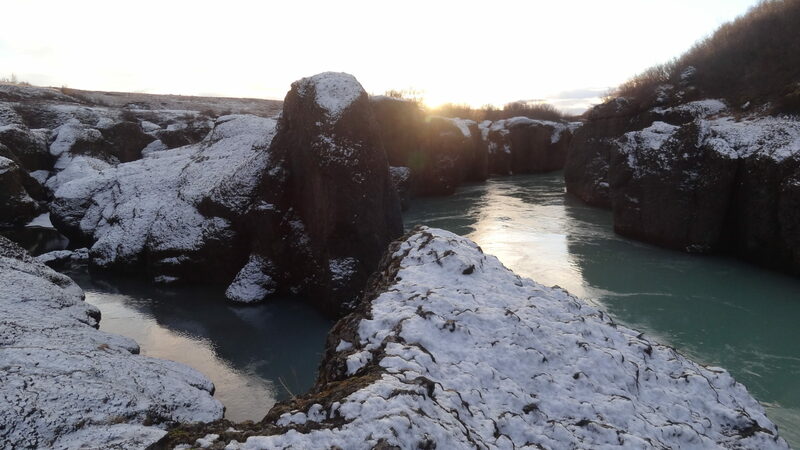 Because we had a limited amount of time to spend in Iceland, we opted for a three-day road trip. There are plenty of tours available, but I do like more independence when I travel, so booking our little SUV was ideal. 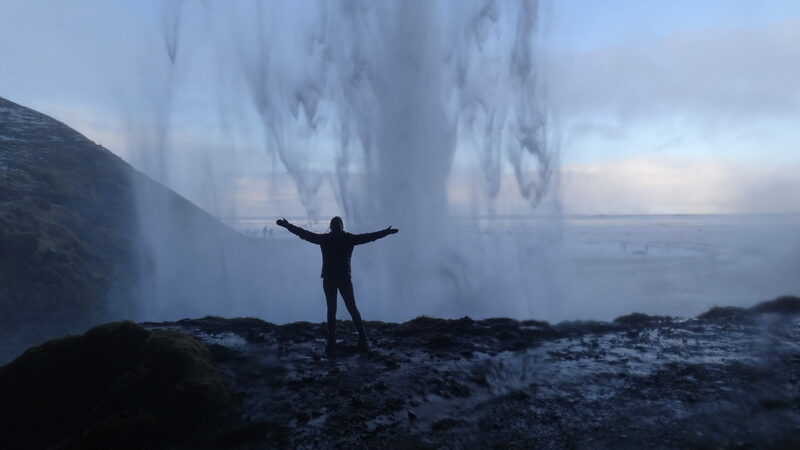 Flying to Reykjavik from the UK is very quick and easy, especially if you only bring a carry-on size bag. I flew with EasyJet from Edinburgh and arrived in Reykjavik at 7 pm. One thing everyone recommends to do is to use the duty-free shop before you leave. The prices are apparently a lot more expensive in the city. I didn’t want to pay more than necessary for my drinks so I picked up a few bottles. In order to get to the city, there are two bus companies, offering transfers at roughly the same price. I picked the Grayline bus. They bring you to their bus depot before putting all the travellers on mini-buses depending on which area you are heading. The other company, FlyBus, brings you to the BSI coach terminal. One thing that is worth mentioning and that my friend learned the hard way is that there are no more buses to the airport after 4 pm on Saturdays in winter. 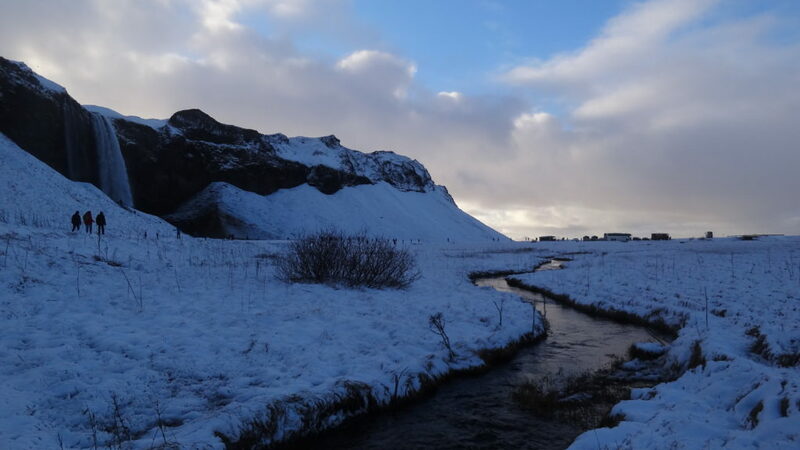 So make sure to look the schedule ahead of time, unless you want to stay in Iceland! The minibus dropped me off at the Grayline office in the city centre and I met up with my friend at the Oddsson hostel. I don’t know if we were just lucky, but the vibe at the hostel was great. There’s a massive lobby and chill-out zone, and a great kitchen with big tables where people can sit around and make new best friends. My favourite kind of hostels. Following my previous experience in Northern Canada, I knew it was worth having a look at the aurora predictions, so while everyone was getting ready for a beer pong game (without a ping pong ball, they had to be creative and ended up using grapes and shredded wheat), I grabbed my jacket and walked along the water. I ended up spending well over 2 hours outside. I wasn’t sure I was going to see anything at all as it was raining when I came out but sure enough, the sky cleared and there they were. Fairly faint but still very pretty pale-green moving auroras. It was a magical start of the trip. Before even taking the time to visit the capital, we picked up a car and hit the road. 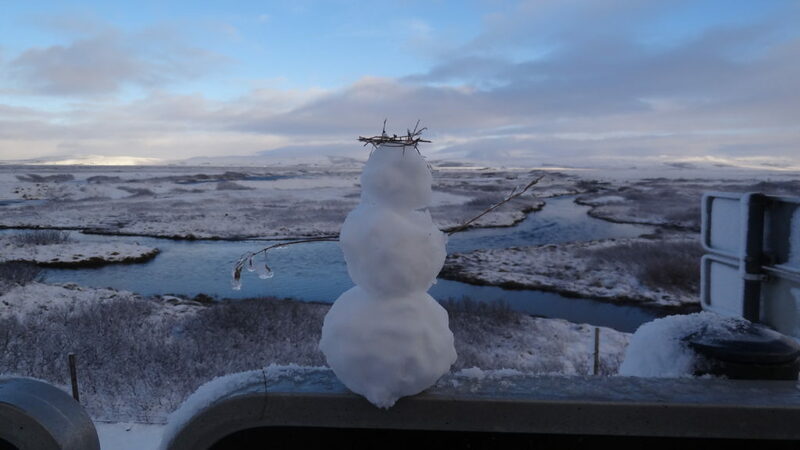 We followed the Golden Circle, driving through the very scenic Thingvellir National Park. 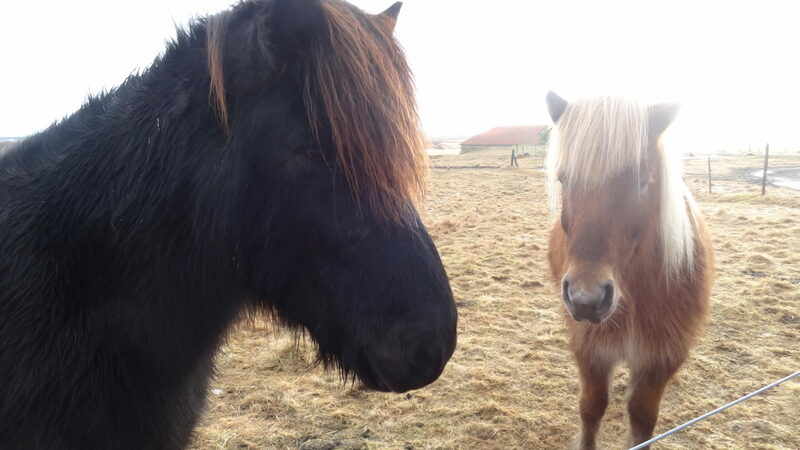 We quickly found some Icelandic horses, so we had to stop to pet them for a little while. We hadn’t made a plan before we left, so we improvised along the way. 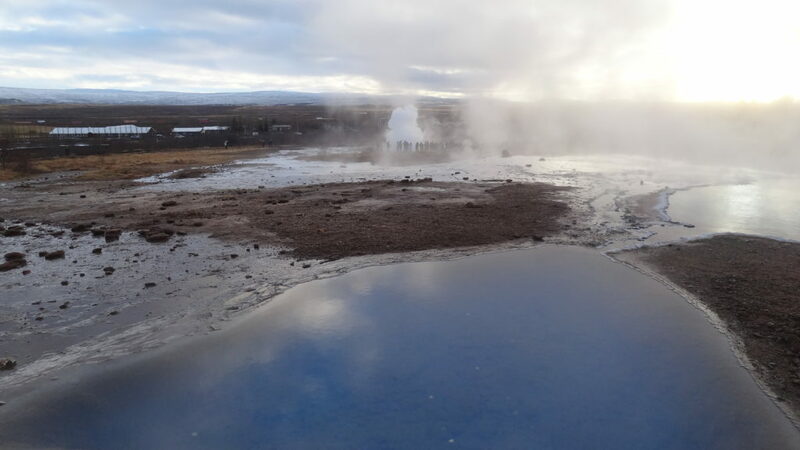 We stopped by the Geysir and found tonnes of tourists. 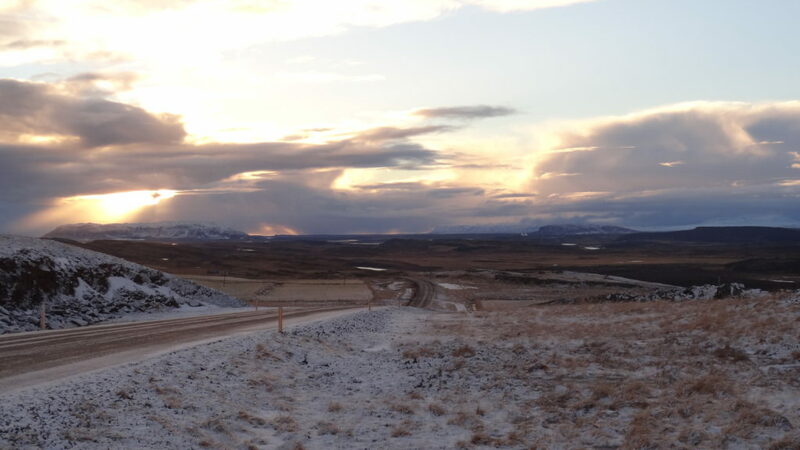 We walked around the site, seeing the big Geysir erupt a couple of times and quickly got back to the quiet roads. Everything is signposted, so as long as you know the name of the place you want to go or at least the first few letters, it’s fairly simple. We followed the sign to the impressively powerful Gullfoss waterfall. After enjoying the scenery for a bit, we got back in the car and took a side road. Everything was so pretty, every turn, the road and the scenery were even more amazing. At one point we saw a tour jeep parked on the side of the road, so we decided to have a look. 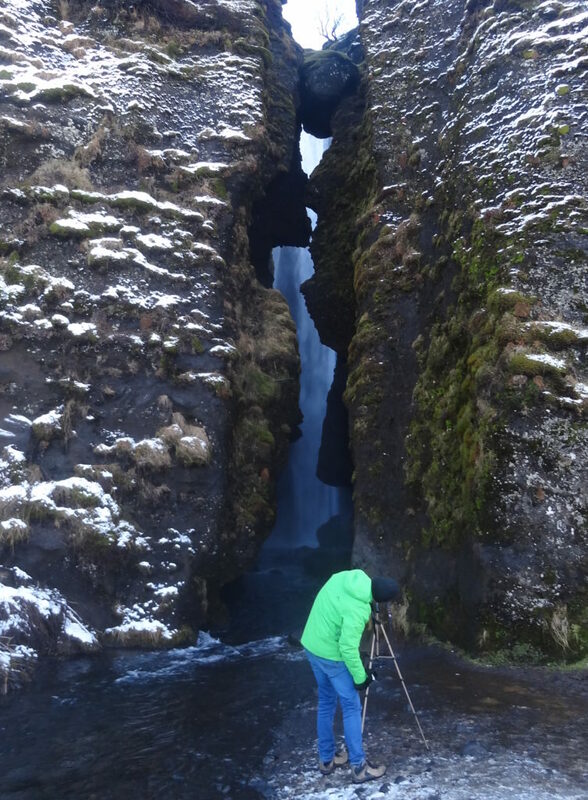 It turned out to be the Brúarhlöð canyon. A great spot for some peace and quiet. We finished our first day of the road trip by a stop to the steamy Secret Lagoon (Gamla Laugin). It was quite crowded when we arrived, but soon the tour buses left, and it was very quiet and relaxing. We soaked for about 2 hours before heading back to Reykjavik. In the hostel, we met up with a bunch of cool travellers, mostly from Canada, the States and the UK. At one point, people noticed the Northern Lights were still visible so my new Alaskan friend Rizza and I went for another walk along the bay. The auroras were a bit brighter than the day before and it was great to share that moment with someone as passionate about Northern Lights as me! For our second day of the road trip, we were joined by Rizza and Adam. It was a great road trip, checking all the boxes for an epic adventure. Gorgeous scenery, laughter, great conversations, snowball fight… it was a truly amazing day. 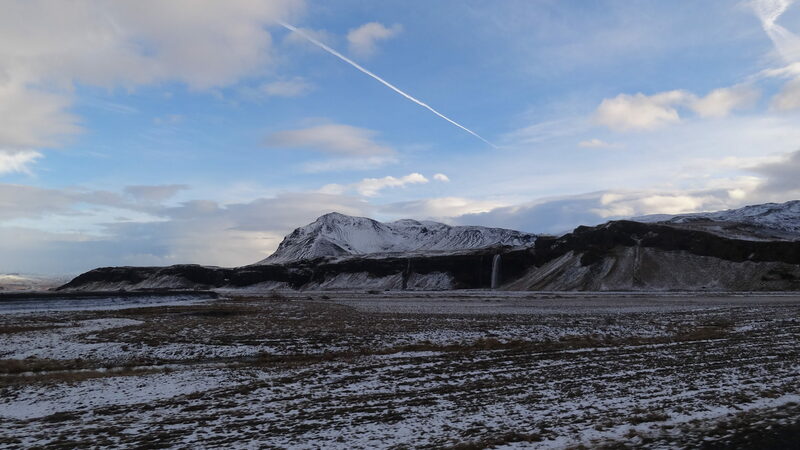 We left Reykjavik but this time drove on the route 1 towards Vik. Our first stop of the day was along the road as we saw some people taking pictures. As there was enough room to safely pull over, we did. The snow was in perfect condition for a snowball fight, so we couldn’t resist! Rizza also made a new snowman friend called Jeff. 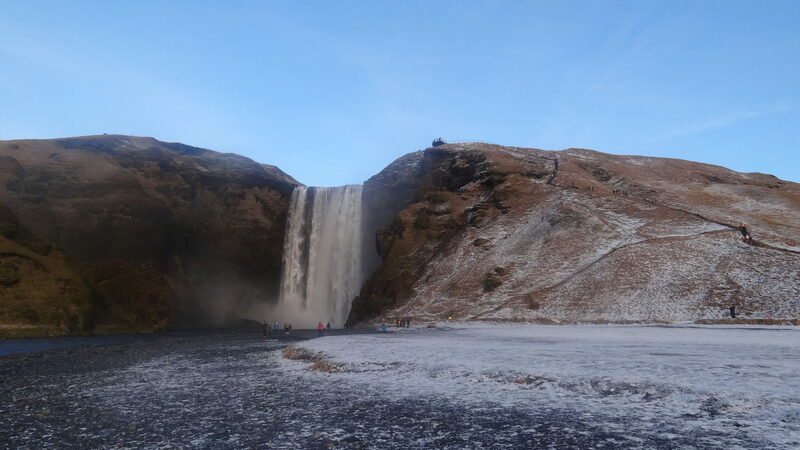 Our first stop in a proper attraction was at Seljalandsfoss waterfall. This is a unique waterfall. At about 60 meters high and with a fairly thin cascade, it probably wouldn’t have the massive amount of tourists it gets if it wasn’t for the fact that you can walk behind the waterfall. It was as amazing and wet as I expected it to be. We quickly got drenched but it was well worth it! About 500m to the side of the waterfall we found another great sight: Gljúfrabúi waterfall. In order to see this one, you have to walk in the canyon on some rocks, or in the water, since the rocks are so slippery! 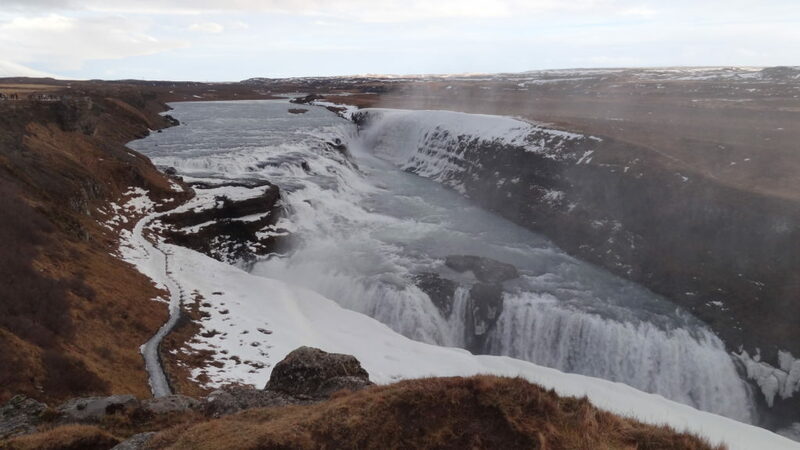 Unfortunately, I didn’t manage to get a decent picture because of all the water spraying everywhere so in order to see it you might have to fly to Iceland yourself! I would highly recommend bringing a waterproof jacket and a change of clothes should you go there, though! The sunlight in Iceland is truly amazing. It’s definitely the kind of light one finds only in the Northern countries and I love it. 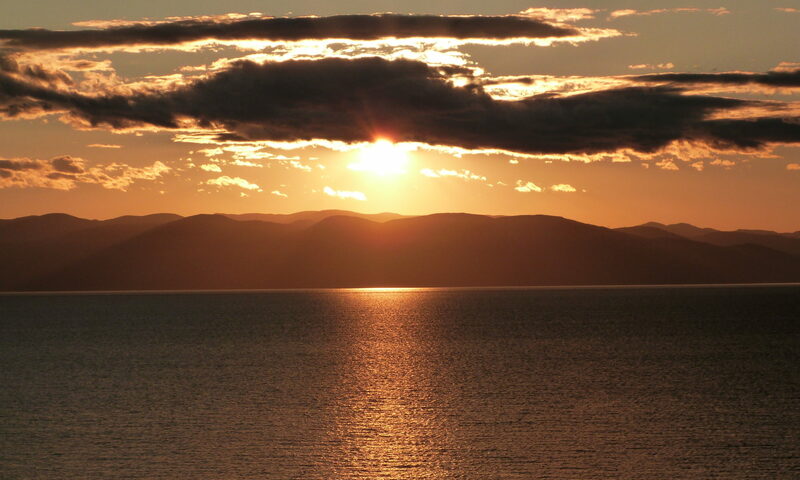 It makes for such dramatic landscapes as it brings out many different shades. We stopped briefly at Iceland Erupt. 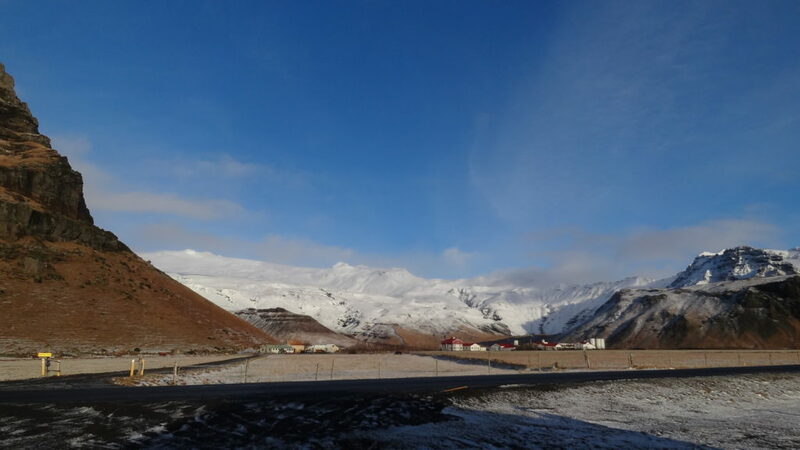 A centre that explains the story of the eruptions of the Eyjafjallajökull volcano. You can actually see the glacier covering the caldera of the volcano from the road, and it’s a good reminder of how powerful nature can be. After Iceland Erupt we went to Skógafoss waterfall. I didn’t get too close this time, as I was almost dry, deciding instead to go up the fairly long flight of stairs to see it from the top. It was great! I even climbed onto a little rock formation before realising it wouldn’t be easy to come back down as it was quite the drop and the rock eroded way too easily. But being the little monkey that I am, I still had to climb it. 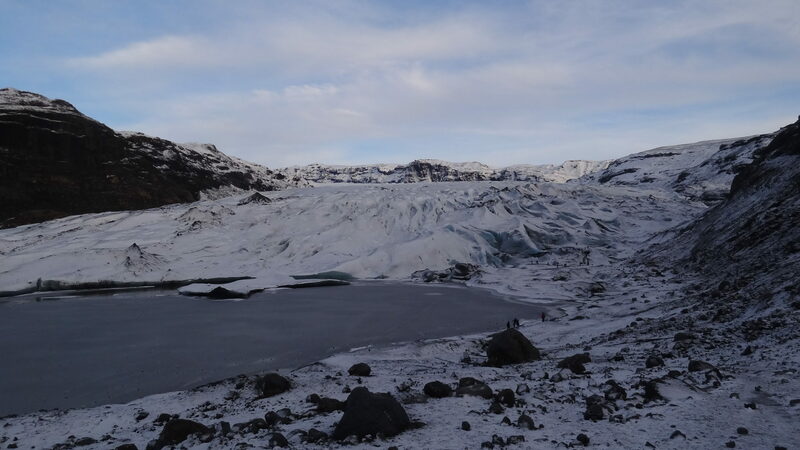 Afterwards, we stopped at Sólheimajökull glacier and it was simply stunning. It’s a great walk to the glacier and there’s so much ice to see. It’s really impressive yet there’s only a tiny bit of the glacier that is visible from this area. 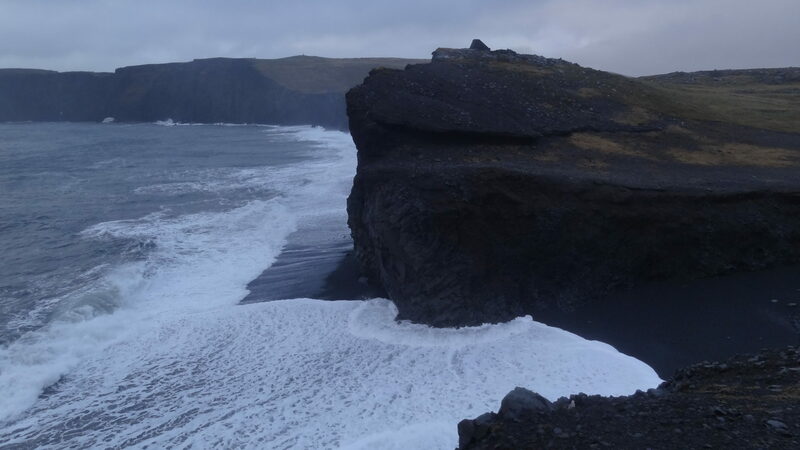 Afterwards, we went to Reynisdrangar where we saw the black sand beach and some of the strongest and biggest waves I’ve ever seen crashing onto a beach. Coupled with an amazing island and the Basalt Sea Stacks, once again it was truly stunning. We kept driving to Vík, the southernmost village of Iceland, and checked in the Vík hostel where we were lucky enough to get 4 beds in the same dorm. We relaxed for a bit and went to Suður-Vik to get some food before hitting the road again for one last epic adventure for the day. Some other people had mentioned a pool they had been to and how they had had the whole place to themselves. That sounded pretty appealing to all of us, so after getting directions from a guide we met walking back from the glacier, we drove to Seljavallalaug, which is one of the oldest pools in Iceland. It was built in 1923 and there’s a trickle of water coming in from a hot spring somewhere nearby. It is by no mean hot like a lagoon, but it’s definitely worth going! Getting there was half the fun. We made it to the end of the road with the car and from there we walked about 15 minutes towards the end of the valley in total darkness. It would have been a perfect setting for a typical teenage American horror movie. Four tourists following rough directions, heading to a pool where there’s absolutely nothing around, in total darkness and including a few challenges like crossing a stream and trying not to trip on rocks. We had trouble locating the path as it was pitch black, but eventually, we made it. I was pretty glad both Rizza and I had head torches, otherwise, I’m not sure we would have been brave enough to give this a try! The water was actually not that hot, more like the temperature your bath water gets when you get out of it, but it was still quite a cool experience to be in the water with no one else around, swimming and looking at the surrounding mountains silhouettes, knowing the glacier was right there too. Unfortunately, the sky was not clear so we didn’t get to see any Northern Lights. My newly found friends were the perfect companions as I’m not sure that many others would have been down to walk to an unknown area, in a very dark night to try to find a pool! It was a perfect end to a great road trip day. The last day of our road trip was another very interesting day. 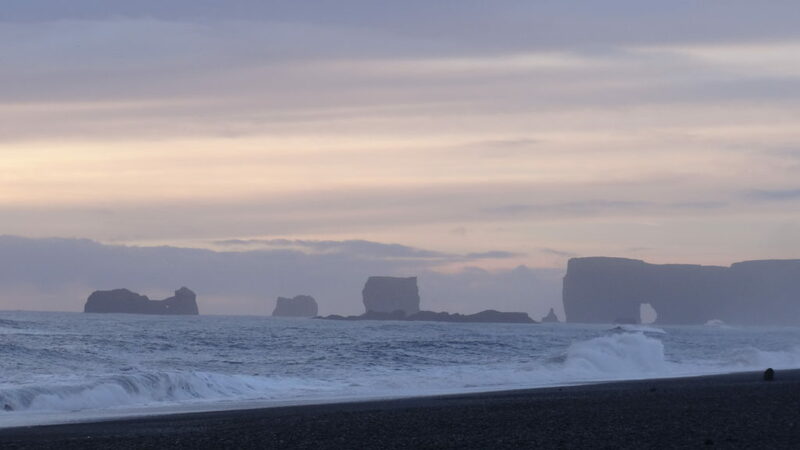 We left Vík at around 10:30 and our first stop was another small black sand beach (Kirkjufjara beach) which boasted a great view over a rock with a hole in it, a little bit like Percé in Canada. It was so windy and rainy, I loved every single minute spent outside as this is my favourite kind of weather when you can feel the full force of the elements. It makes me feel like I can finally breathe. Later on, we stopped at a random spot because Adam had a look out of the window and his hat flew away. We turned around to pick it up and did a little photoshoot as the view was simply amazing once again. We made our way pretty much straight to the airport to drop Rizza off as it was already time for her to head back home. Afterwards, we returned to the Secret Lagoon where we joined a few people we had met at the hostel. When we arrived at the lagoon I wasn’t feeling super sociable so I said a quick hello and swam a bit further away. I’m not used to travelling with people anymore, and sometimes you just need a breather. Especially when there is the option of soaking in a very relaxing lagoon! We stayed for another two hours in the water and it was amazing. Very relaxing once again. 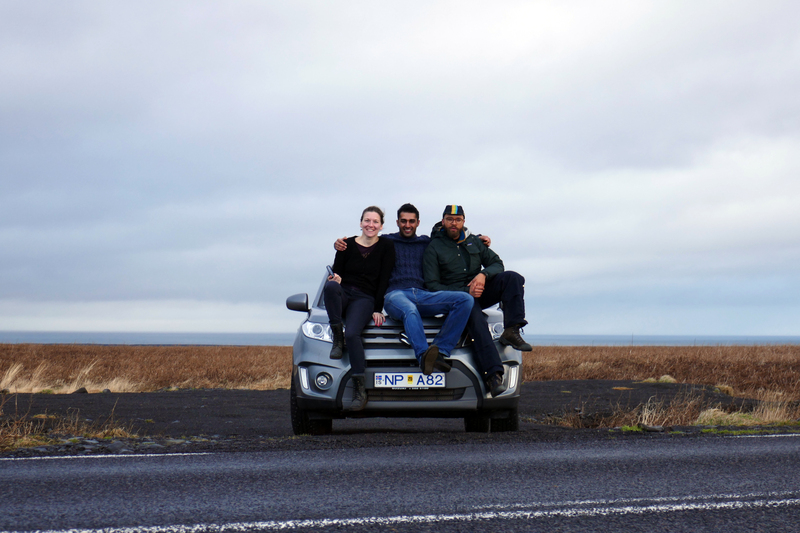 We headed back to Reykjavik, dropped the car and met with all our friends in the hostel. 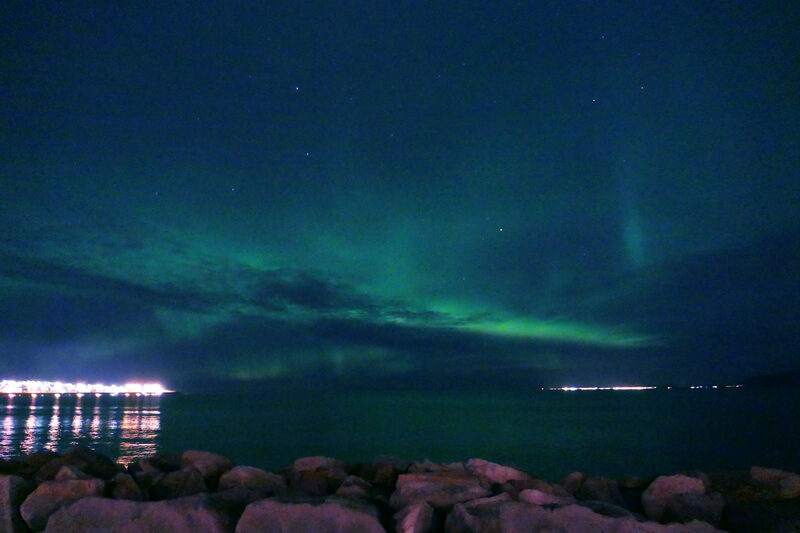 It was Friday night, so we had to have a look at Reykjavik’s nightlife. It’s not something I do much anymore, going out dancing, but this was a great night where I met many locals and had an overall amazing time. 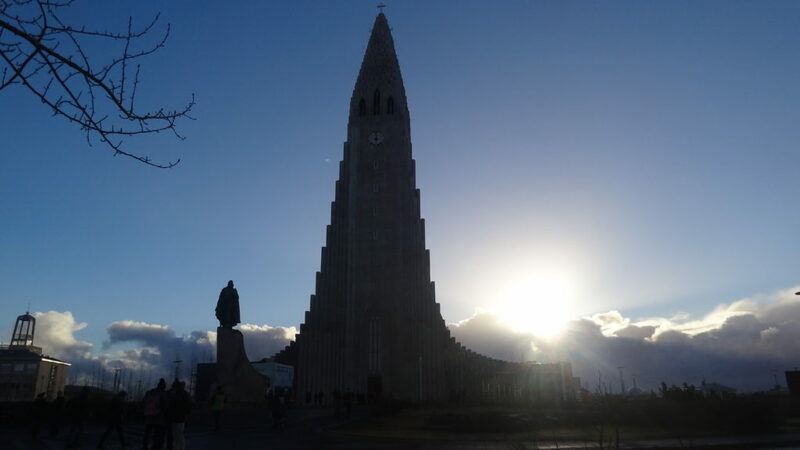 For my last day in Iceland, I went to Hallgrímskirkja, an interestingly different church in the centre of Reykjavik. As always when I am in a city, I had to go up the tower to have a look at the view. And as to be expected, it was lovely! We went to Gló for a very tasty meal (they have options for vegan, raw and meat-eater alike) and it was already time for me to get on the bus and get back to the airport. It was the first time in my life where I thought that missing my flight would actually be amazing. I mean, I would have to stay in this awe-inspiring country. It could be a lot worst! My love story with Iceland is far from over. We have just started to get to know each other, and already I know I will return. I’ve never felt compelled to stay somewhere in my years of travels, but Iceland clearly won me over. 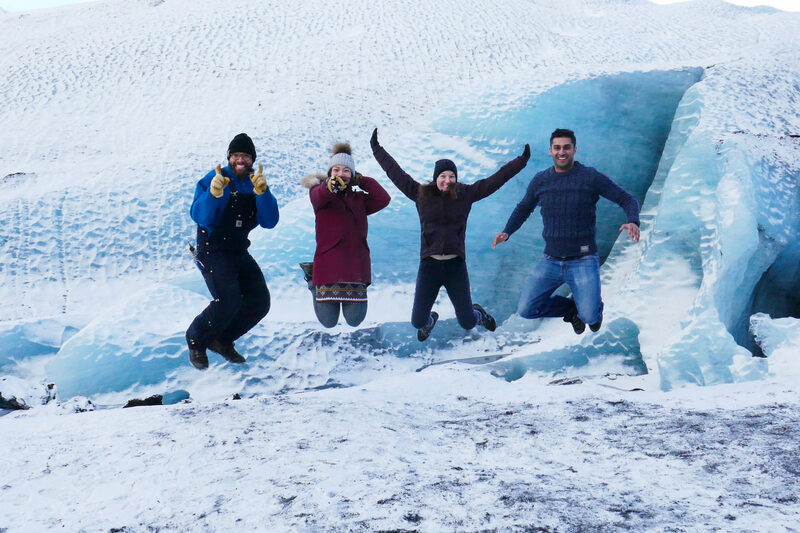 If you happen to know of a tourism business in Iceland who would be interested in hiring a passionate and friendly Canadian, let me know!